BOTH SIDES HANDPAINTED, SEE DETAILED PICTURES BELOW. Color: Black background and Red Carnation Flowers. 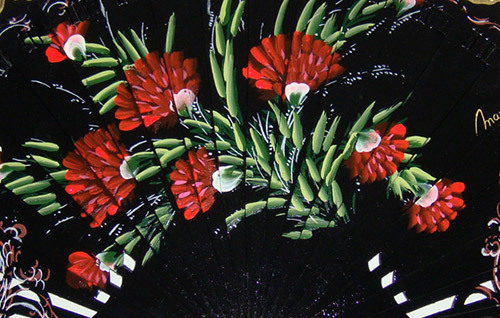 This Spanish handpainted wood fan is a high quality traditional imported fan from the most prestigious manufacturer in Spain. The fan has been signed by the artisan who handpainted this piece. It is a very useful item during hot summer days and nights, it fits perfectly in your purse so you can take it to any event like weddings, dinners, etc.